As we explained in our main page on Durga devi, the return of the worship of Our Mother God as supreme Deity and sole Creatrix begins with the story of the mighty battle between the devi and the demon. There is a special sense in which the Great Conflict between Light and darkness stands at the foundation of our Age. For the Herthelani this is depicted as the battle of the Empress Sai Rayanna, the incarnate Sun, against the demon hordes. In India such a battle stands at the beginning of the return of the full recognition of Dea as Absolute Deity to the patriarchal Indian mainstream. 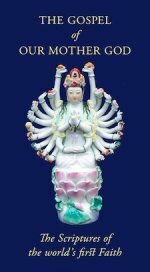 The Devi Mahatmya, which tells this story at length, makes clear the thealogy of Durga Devi, which is also the thealogy of Our Mother God in all Her myriad forms. She Creates, Maintains, and Destroys the cosmos. As Creatrix, Preserver and Destroyer she is Trinitarian in form, as She is the world over (see our page on the Triple Goddess). In this short clip, we see these points emphasized. First we see Her in Her three forms as Parvati, Saraswati and Lakshmi. The three Forms come together to confront the demon, and give rise to myriad Forms, thus underlining the fact that all the many Faces of Dea are Aspects of the Feminine Holy Trinity. Finally her myriad Forms merge back into the Three, and then the Three into One as she delivers the coup de grace to the demon. 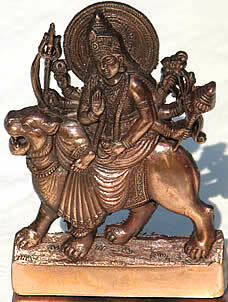 The One is, of course the One Supreme Dea, but in Her special Vikhelic form as Durga devi. This graphically demonstrates how the worship of a particular Aspect of Dea is also the worship of the One Supreme Dea Herself. Thus, in this short video clip we see enacted the doctrine of Dea's Oneness, her Trinity, Her multiplicity and also the way in which a particular Janyatic or Angelic Aspect – in this case, Sai Vikhë or Durga devi – can be the Form under which we see the One indivisible Dea. We hope the poor quality of this clip will not detract from your appreciation of its spiritual message. In this video clip we concentrate on the mysteries of divine Unity, Multiplicity and Trinity. We see them merge and emerge as in a dance, even as the defeat of the demon is part of the Divine Play (or lila) of Our Mother God. In our next video clips we shall examine different aspects of the war with the demon, the battle between Light and darkness, and the descent of Dea to restore Order and harmony (thamë, dharma) to Her creation in times of disruption. The Battle against the Demon Part 2: This is another video clip (not actually a sequel to the one above) and in this we focus on Durga as Saviouress and Righter of Wrongs. The Supreme Deity who descends to Her created world in time of need. The Defeat of the Demon Part 3: Again, not a sequel, but a summation of the Divine Victory to the ecstatic, loving and martial chant of of "Durga hai meri ma". We see that the Divine Warrior-Maiden is not merely a Hindoo Goddess but our Universal Protectress and Mother God. The Story of Sai Rayanna, the first Herthelan Empress and warrior-queen, the equivalent of Durga in an all-female society.